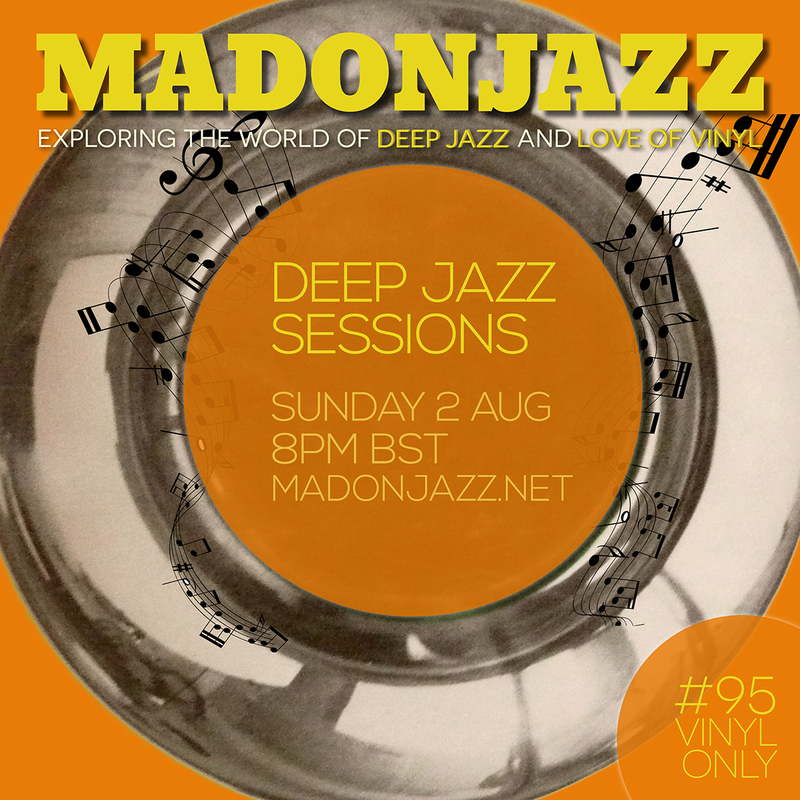 MADONJAZZ ‪#95 – ‎Deep Jazz‬ Sessions, exploring the world of deep jazz and love of vinyl. A 2hr special with Mark G. on the decks, sharing with us his favourite vinyl-only rare ‎jazz‬, eastern, oriental‬ and ‪afrojazz‬ grooves! Enjoy! 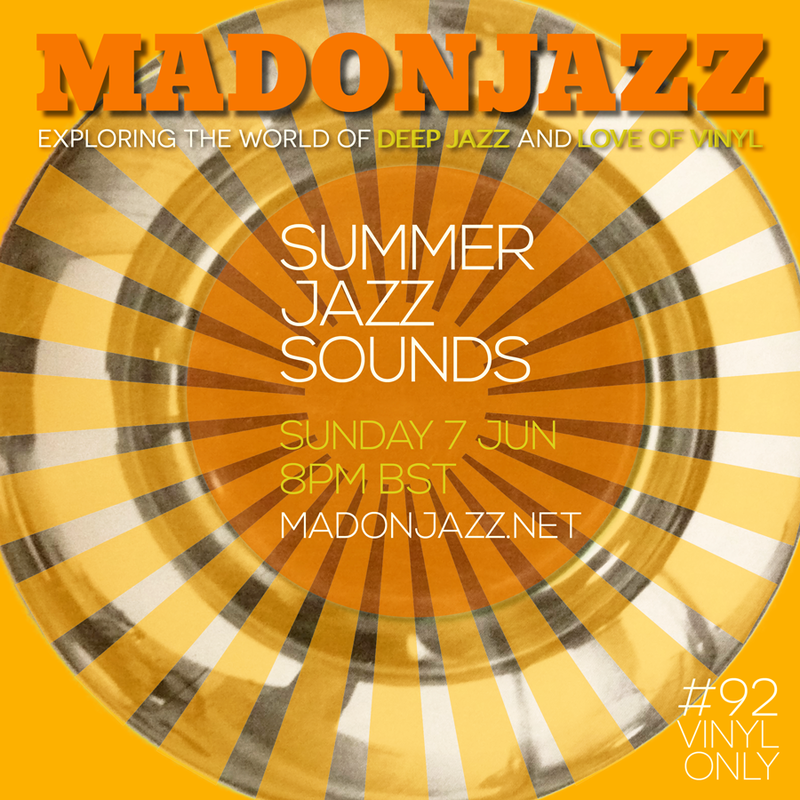 MADONJAZZ #92: Summer Jazz Sounds – 2 hrs packed with summery deep jazz across all sub-genres. Celebrating the start of summer with vinyl-only jazz classics from Horace Silver, Art Blakey and Kenny Dorham mixed with gems from Owen Marshall, Noah Howard, John Berberian and T. Nakamura. Enjoy! 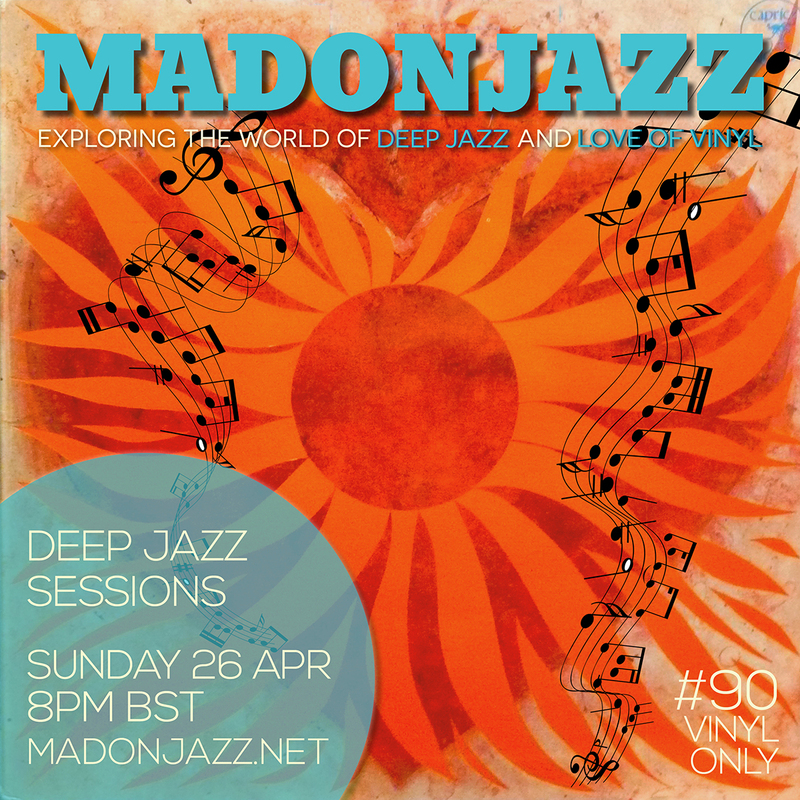 MADONJAZZ #90 with Thea and Mark G. exploring the world of deep jazz and love of vinyl. A vinyl-only two-hour session of more jazz gems from Robin Kenyatta, Mal Waldron, Maffy Falay & Sevda, Jackie McLean and Don Cherry, amongst some brilliant new finds from our recent diggin’ trip in Paris – enjoy! 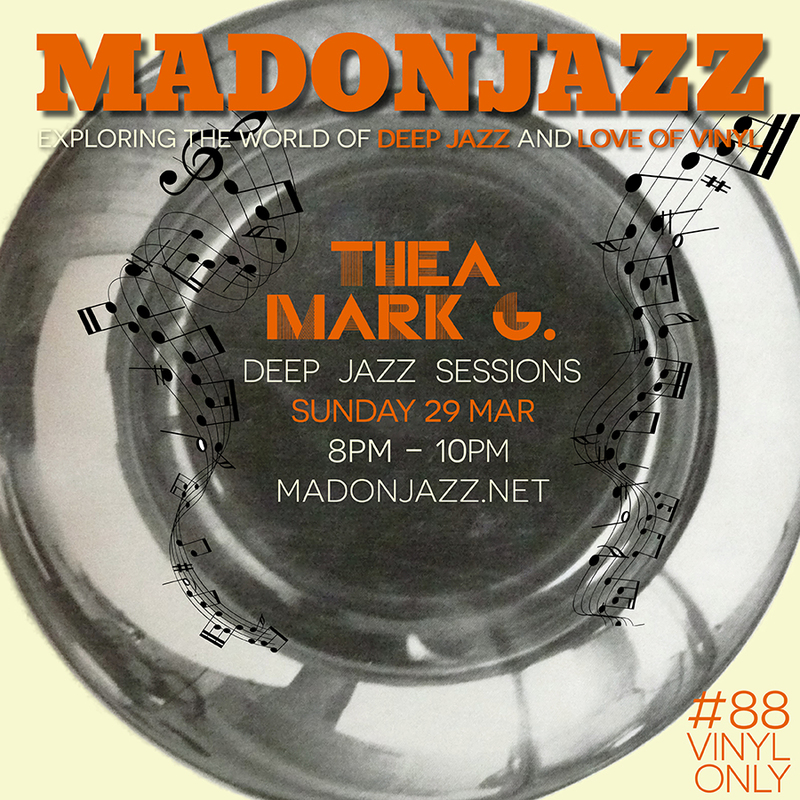 MADONJAZZ #88: Deep Jazz sessions, w/ Thea & Mark G., exploring the world of deep jazz and love of vinyl. This issue is packed with deep jazz vinyl-only favorites, such as new releases from Emanative and the Jazzman Spiritual Jazz 6 series, along masterpieces from Cochius, Hannibal, Steve Reid, Sun Ra, Clifford Thornton, Yusef Lateef and many many more! Next MADONJAZZ is on Sunday 12th April at 8pm British Summer Time! 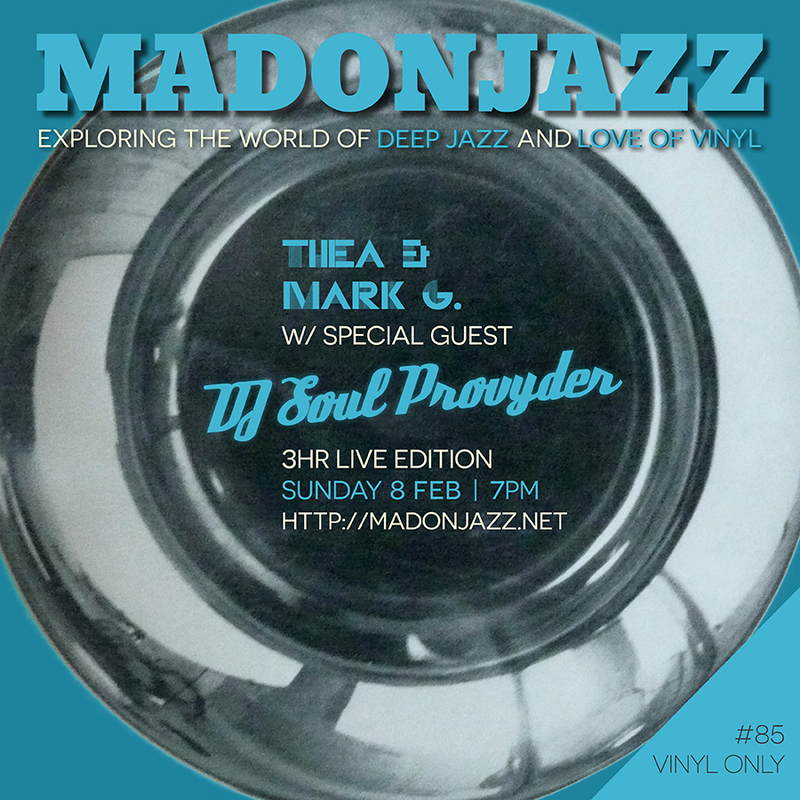 MADONJAZZ #85 w/ guest DJ Soul Provyder – a 3hr vinyl-only special, including an exclusive jazz-influenced set one of the original veterans in the London dance scene, DJ Soul Provyder, packed with gems from his private collection. Djsoul Provyder is a record collector and DJ since 1991, playing at many venues across his home town of London over the years (Ronnie Scotts, Jazz Café, Koko, Sketch, East Village and Momo’s to name a few) including many festivals (Isle of Wight, V Festival and Southport Weekendender). He is currently a resident at the SUNSPLASH FESTIVAL held in the South of Turkey and has played playing alongside DJs such as Louie Vega, Kenny Dope, Giles Peterson, Norman Jay, and Phil Asher. We were really excited to have him – enjoy! MADONJAZZ #84: Celebrating 2 years! 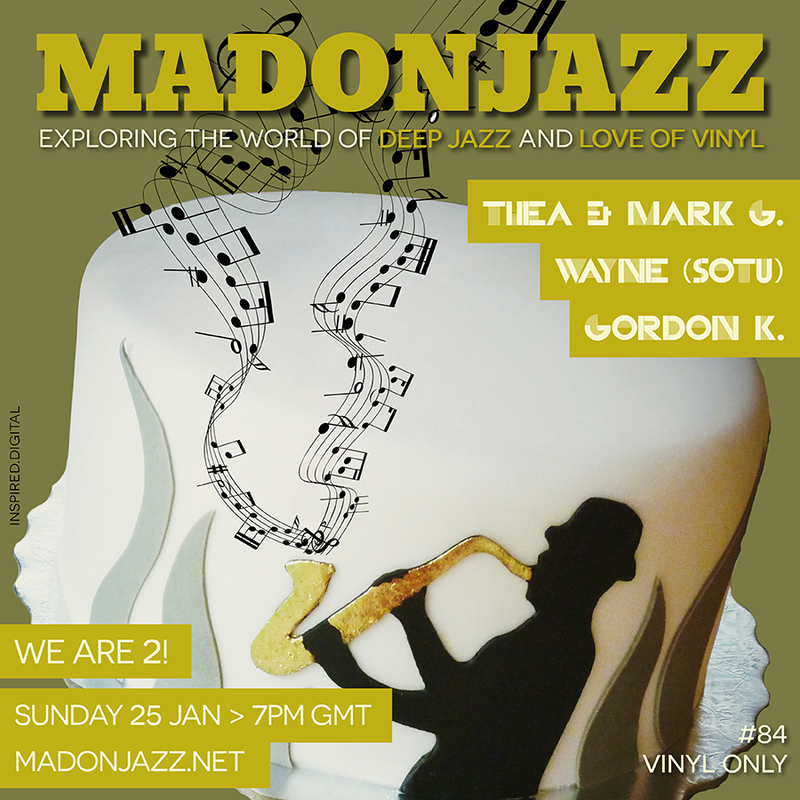 MADONJAZZ #84: a 3hr vinyl only special celebrating our 2nd birthday! Usual suspects Thea & Mark G. were joined by Gordon K., to celebrate our love of jazz with quality gems across all jazz sub-genres. Hope you enjoy it as much as we did! MADONJAZZ #83: Deep Jazz sessions 2015 – the first show of the new year, with Thea and Mark G., exploring the world of deep jazz and love of vinyl. It includes an amazing 1hr mix by Mark G., full of deep jazz rarities. Vinyl only. Enjoy! Join us for the next show is on the 25th January 2015 at 7pm, where we’ll be celebrating MADONJAZZ’s 2yr birthday, with some pretty special guests! 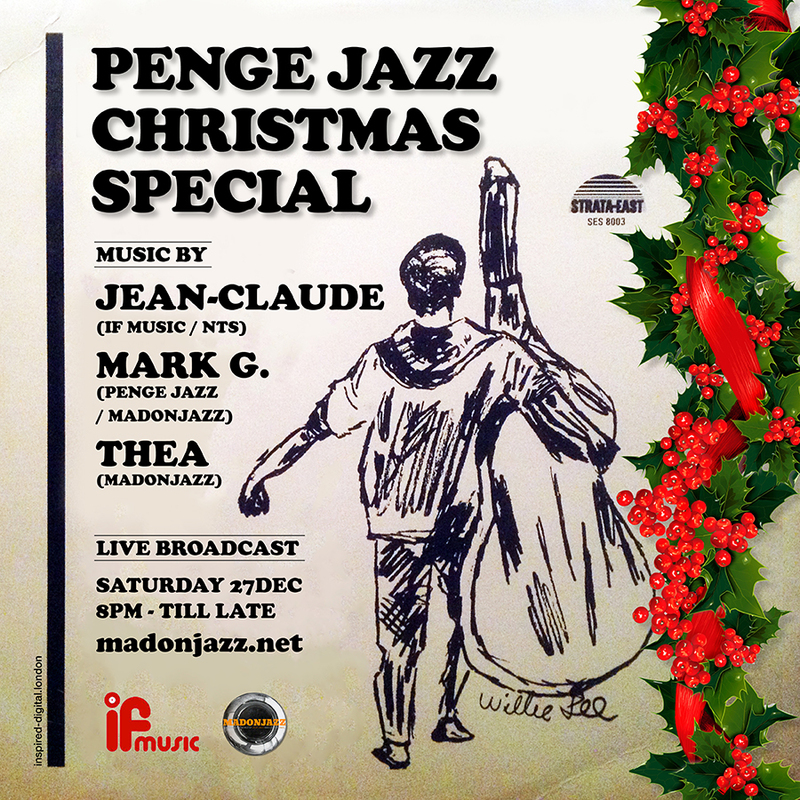 Penge Jazz Sessions were back for a Christmas special, and what amazing sessions they’ve been! Session 3 sees Jean-Claude ( If Music / NTS), Mark G. (Penge Jazz / MADONJAZZ) and Thea (MADONJAZZ) B2B, selecting the finest ‪deep jazz across all jazz sub-genres, including obscure Indian, Middle-Eastern and world jazz rarities – absolutely unmissable! Vinyl only. Jean-Claude is the owner of If Music, a boutique record store in London with an outstanding collection of rare, fine vinyl. Session 2 sees Jean-Claude ( If Music / NTS), Mark G. (Penge Jazz / MADONJAZZ) and Thea (MADONJAZZ) B2B, selecting the finest ‪deep jazz across all jazz sub-genres, including obscure Indian, Middle-Eastern and world jazz rarities – absolutely unmissable! Vinyl only. Jean-Claude is the owner of If Music, a boutique record store in London with an outstanding collection of rare, fine vinyl.